One flaky family. One ex-boyfriend who won't go away. And one handsome stranger who probably will ... For fans of Doc Martin and and Monica McInerney, a warm, witty novel, brimming with the trademark romance, friendship and eccentricity that Danielle Hawkins's readers love. 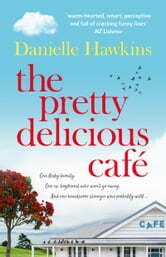 On the outskirts of a small seaside town, Lia and her friend Anna work serious hours running their restored cafe. The summer season is upon them, they have Anna's wedding to plan and Lia's ex-boyfriend seems not to understand it's over. When a gorgeous stranger taps on Lia's window near midnight and turns out not to be a serial killer, she feels it's a promising sign. But no one comes without a past, and his arrives in the form of a four-year-old son. Just as Lia decides to give things a try, problems from her own past rear up. The Pretty Delicious Cafe reminds us of the joy -- and hazards -- to be found in family, friends and good food -- and that being a little bit weird isn't necessarily a bad thing. If your looking for a nicely put together book that demands nothing of you & is predictably predictable, you'll enjoy this, I did. I love Danielle's charactors, they are refreshingly normal and effortlessly entertaining, the kind of people you would welcome at your campfire. Can't wait for her next book. ***I voluntarily reviewed an Advanced Reader's Copy of this book for my honest review & I thank the publishers Harper Collins NZ*** I always enjoy reading books about places I have been to or want to go, they are like mini-holidays. This book is a based in a quintessential rural New Zealand seaside township, Our main character is Lia and her sidekick/best friend Anna run their cafe in a quaint old house surrounded by beautiful scenery that NZ is famous for. With the Summer season ramping up, their hours get longer and with Anna about to marry Lia's twin brother, there is plenty to get stressed about. Plus Lia has the issue of her ex not understanding that she is not interested in getting back together. But there could be a new romance in the horizon for Lia... I had a laugh out loud moment when the scene that introduces Lia to the new mechanic in town, and after the shock, she likes what she sees standing there in the dark. Lia and her twin have always had their "Twin Thing" but Lia has always had an odd sixth sense and it seems to be on overdrive after the handsome fella arrives in town. But he brings his own past with him, and it may be too much for him to risk starting something new with Lia. Will Lia's intuition help or hinder her, when it comes to her love life, and does she have time for a relationship anyway? What with the shop and of course, the hilarious wedding issues that come up to stress the girls even more. You will be glued to the pages to see what will happen next in this sleepy town. Will there be another wedding in the distant future, or will their pasts get in the way? The book is an easy read, a fabulous choice for a relaxing weekend or holiday read, it has it all, suspense, humour, Love, Jealousy and it also covers subjects such as depression, which I felt was well written and very believable within the storyline. There is a bonus for those Bakers out there, with a few recipes that are mentioned in the book. I think I may have a go at them some weekend (IF I can put my latest book down for long enough). A fun novel with characters you can easily identify with. I really enjoyed this light read.